Sometimes — when I watch “The Parent Trap” for the 69th time, for example — I get sad about this. But as I get older, camp seems weirder and weirder to me. It's this weird place you send your psychotic kids where they will be given guns, bows, arrows and easily-capsizable boats, all while supervised by drunk 18-year-olds who can't stop giving each other hand jobs. 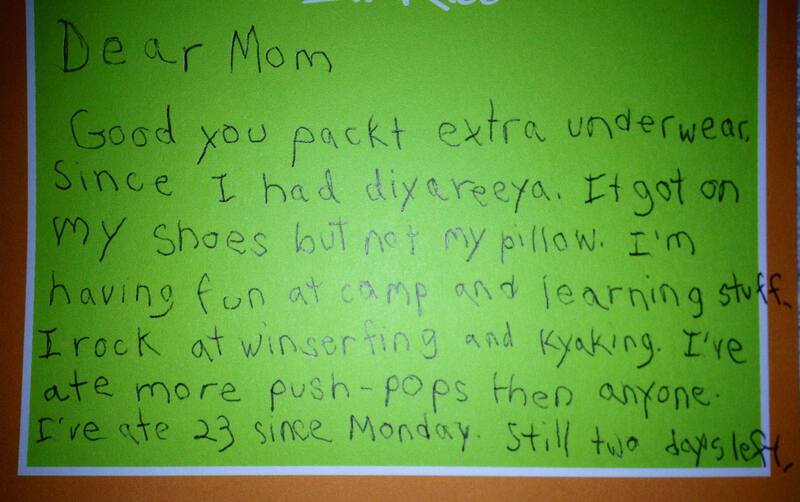 And yet, camp is responsible for letters home like the one below, which is one of the most beautiful and human things I've ever read. There is more life and pathos packed into this little kid's three pieces of paper than in the Old and New Testaments combined. I am sure this will inspire alien historians to write many scholarly alien articles for publication in alien academic journals that no regular aliens actually read. Dear Mom Good you packt extra underwear. Since I had diyareeya. It got on my shoes but not my pillow. I'm having fun at camp and learning stuff. I rock at winserfing and kyaking. I've ate more push-pops then anyone. I've ate 23 since Monday. Still two days left. I'm dying. There's something about the "it got on my shoes but not my pillow" that just annihilates me. It's like, according to him, diarrhea always gets on either your shoes or your pillow, and he's lucky he got shoes this time around. 37 is the rekerd and I can beat it. Sweet! I went horseback riding and the horse in front of me took 3 huge dumps. 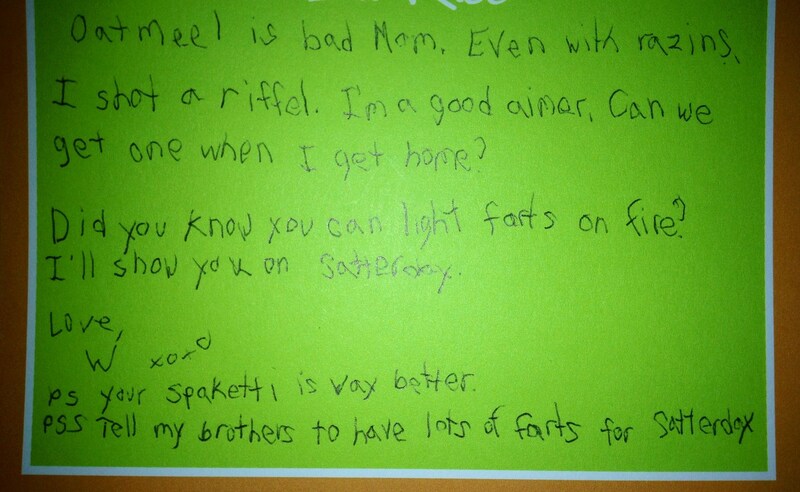 Smoke came off the poop. It was awesome I used my toothbrush to dig for werms. Don't freek out. The guy in the bottem bunk lets me use his. Its safe. I don't know his name but he can burp the alphabit like me. 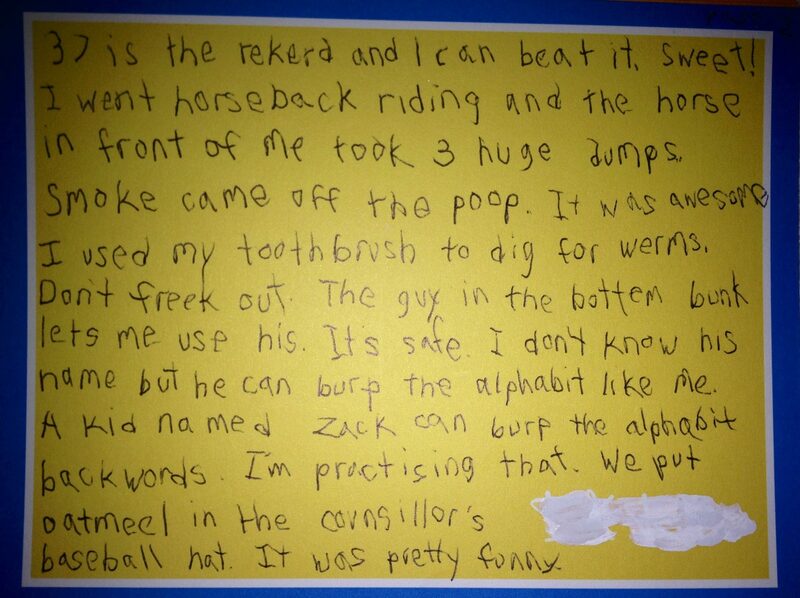 A kid named Zack can burp the alphabit backwords. I'm practising that. We put oatmeel in the counsillor's baseball hat. It was pretty funny. Don't freak out mom, I use my toothbrush to dig through the dirt and clean my teeth with one from a guy whose name I don't know, it's fine. God, that Saturday must have been epic.